NBA Hall of Famer Shaquille O’Neal has a lot going on: He’s the Chief Fun Officer for the Carnival Cruise line and the proprietor behind new fast-food chain Big Chicken, which recently opened in Vegas. 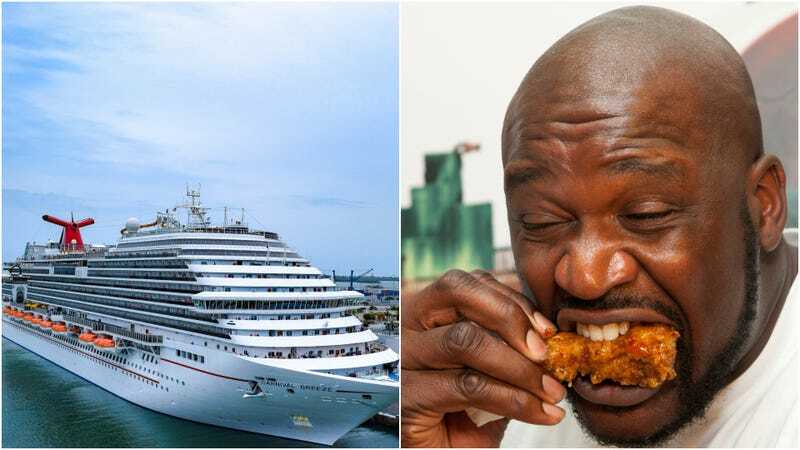 Now Shaq is combining those interests, by announcing that he will open a second Big Chicken shop on the renovated Carnival Radiance ship. Big Chicken will be an additional free option for cruise passengers who may be tiring of the same old classic carnival buffet. Instead, passengers can partake of Shaq’s variety of fried chicken sandwiches and fries “with flavors to match Shaq’s larger than life personality.” These sandwiches also sport “playful monikers inspired by Shaq’s litany of clever nicknames for himself”; judging from Big Chicken’s existing menu, those self-appreciating nicknames/sandwich names include M.D.E. (for Most Dominant Ever), Shaq Attack, and Superman. “As Chief Fun Officer, I want to bring even more fun to every aspect of a Carnival cruise, including what guests eat,” said O’Neal. A quick Google search makes it unclear whether anyone else in the world has the title of Chief Fun Officer, which for Shaq so far has involved filming ads promoting himself in the role offering online tours of the Carnival Cruise lines.